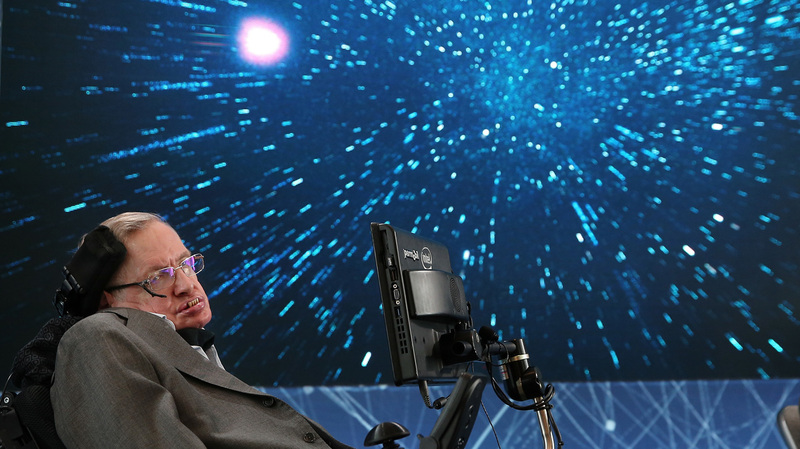 Stephen Hawking's Voice Is Being Broadcast Into Space The late scientist's voice will be "beamed toward the nearest black hole," his daughter tells the British press. Hawking is being interred at Westminster Abbey on Friday. The voice of legendary physicist Stephen Hawking is to be broadcast into space after his memorial service on Friday, according to British media outlets. Specifically, it will be directed toward the nearest black hole. Hawking, who died in March, revolutionized the scientific understanding of black holes — and won the hearts of people across the world with his tireless scientific advocacy. Hawking is being interred at Westminster Abbey on Friday, with a thousand members of the public (selected through a lottery system) present for the ceremony. The physicist's remains will be placed between those of Isaac Newton and Charles Darwin. His voice will be broadcast into space after the service honoring his life. Hawking's words "have been set to an original score by composer Vangelis, most famous for his Chariots of Fire film theme," the BBC reports. In a statement provided to British media outlets, Hawking's daughter, Lucy Hawking, called the music a "beautiful and symbolic gesture that creates a link between our father's presence on this planet, his wish to go into space and his explorations of the universe in his mind." She said the broadcast will be directed toward "the nearest black hole, 1A 0620-00, which lives in a binary system with a fairly ordinary orange dwarf star," according to multiple outlets. Hawking, who had a debilitating neurological disease, lost his ability to speak with his own vocal cords decades ago. He spoke with the assistance of a computer — and his computerized voice became distinctive and instantly recognizable. As technology improved over the years, Hawking refused to upgrade his speech technology — because he had grown attached to the original voice he adopted in the '80s, as the San Francisco Chronicle and NPR have reported. With the original hardware degrading over time, a team of engineers worked to save Hawking's voice. They finished their project shortly before he died.